A beautiful breakfast treat for your sweetheart! 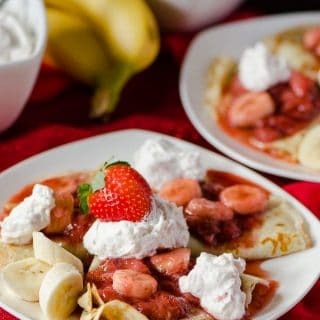 Fresh strawberries, bananas, and hazelnut spread, rolled up in thin, delicious crepes, topped off with homemade strawberry whipped cream! 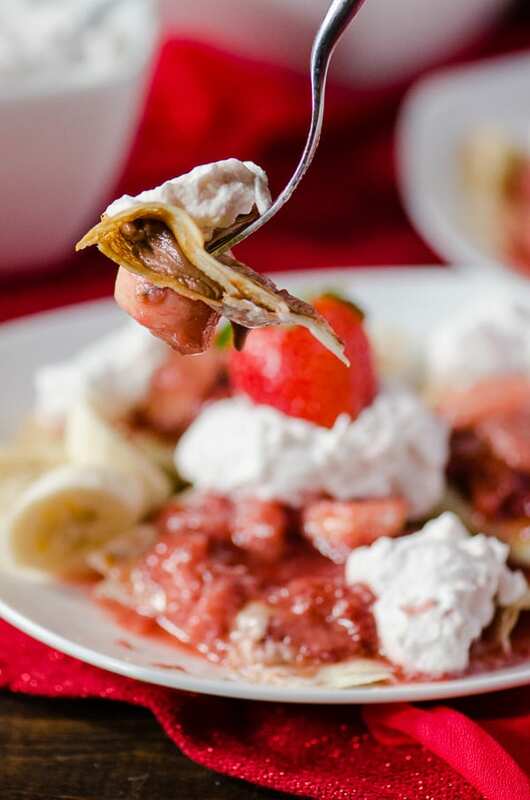 I’ve been looking for a reason to share these Strawberry Banana Hazelnut Cream Crepes with you guys. Not that they require some special occasion to grace your breakfast table, but there’s no more perfect day to make them for someone you love than on Valentine’s Day! Whiiiiiiich happens to be today. Welp. I’ve fallen slightly behind here, but if you’re an early riser and are reading this, you can still throw them together before the house wakes up! 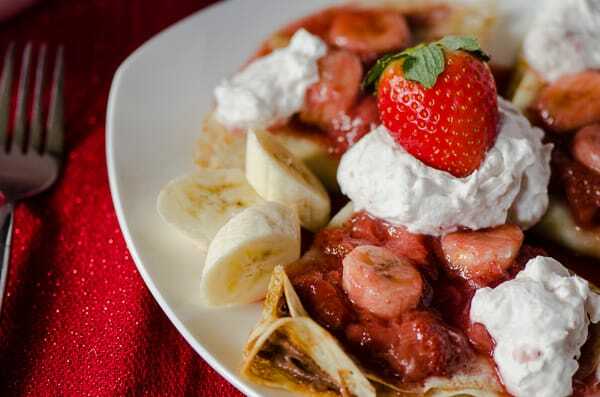 JUST TAKE ME TO THE STRAWBERRY BANANA HAZELNUT CREAM CREPES ALREADY! 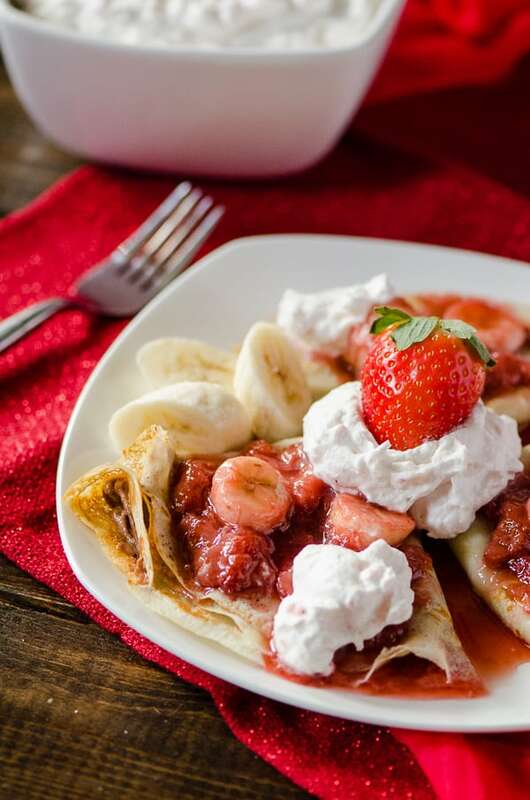 If you’d rather skip my (pretty darn helpful) tips and tricks, essential cooking info, and similar recipe ideas – and get straight to this deliciously easy strawberry banana crepes recipe, just scroll right on down to the bottom of the page where you can find the printable recipe card! My obsession with strawberries has only grown since our big Sunday Supper Live! Tampa excursion. Before immersing myself in berry wisdom for 48 hours, I just loved them. I’d whine when they were small, or sour, or couldn’t find my favorite brand. Now that I’m a self-proclaimed strawberry expert, you can find me shooting off at the mouth about calorie counts, hybridization, recipe potential, and all kinds of other facts my unwilling victims usually give me the side-eye about. Apparently, no one likes a know it all. I can’t help myself. It’s so much fun to spread knowledge when you’ve experienced such a seemingly common way of life firsthand! Prior to our trip, I’d never been to a farm, much less a strawberry farm, to see all the work, love, and dedication that goes into every single heart-shaped fruit. I had no idea those pretty little white flowers are what become the actual berries, and when they’re picked, they’re only handled once – the moment they’re plucked from the gorgeous plants they called home. I honestly couldn’t fathom just how many acres of them grow in Plant City, Florida. If you see Fresh From Florida Strawberries on the clamshell at the store, you know they came from that tiny strawberry family town! Let’s just say I look at my winter stars a lot differently than I used to. And the gorgeous ones are finally rolling out to stores now that they’ve had some cold weather to plump them up, so I’ve been eating my weight in them! For example, in my absolute favoritest crepes of all time – these babehs! Absolute breakfast perfection. 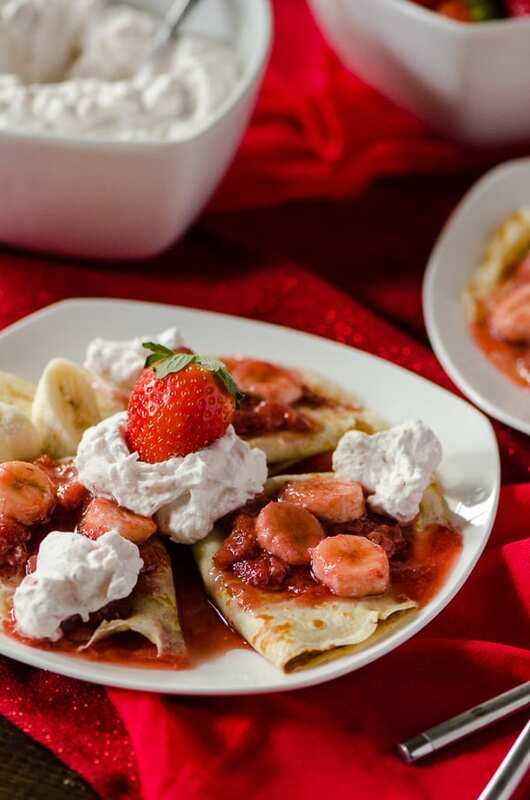 Delicate crepes, simple and stuffed full of gooey chocolate-hazelnut spread, fresh banana slices, and shiny strawberries. And then I went and made strawberry whipped cream just for a little more fun. I may have gone a tad overboard on how much I used on my own plate. Trying to get in that daily requirement of fruit, you know. Sacrifices have to be made. LOOKING FOR MORE STRAWBERRY BREAKFAST RECIPES? Combine all ingredients in a large bowl. Beat until well combined. Refrigerate for at least 30 minutes before using. Heat a 10-12" frying pan over medium-high heat (adjust based on your stove top.) Brush skillet with butter or spray with cooking spray. Pour ¼ cup of batter onto the griddle, tilting the pan in a circular motion so that the batter coats the surface evenly. Cook the crepe for about 1 minute, or until the top begins to look dry. Loosen with a spatula, turn and cook the other side for about 30 seconds, until brown spots appear on the bottom. Remove to a plate and keep warm, repeating the process with the remaining batter, spraying with more cooking spray as needed. Combine strawberries, sugar, and water in a saucepan set over medium heat. Bring to a boil, then reduce heat to low and simmer until sauce has thickened and slightly reduced. Set aside to cool. Add sliced bananas just before serving. Beat cream cheese and hazelnut spread together until smooth and creamy. Whip heavy cream with a hand mixer until soft peaks form, then add sugar. 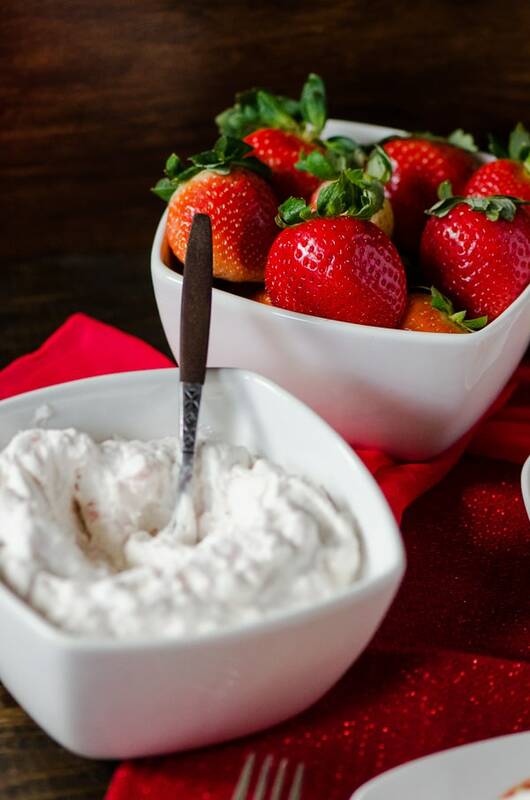 Continue to whip to medium peaks before adding pureed strawberries. Mix in on low speed until combined. Spread Hazelnut Cream on each crepe, then fold in half, and then in quarters. 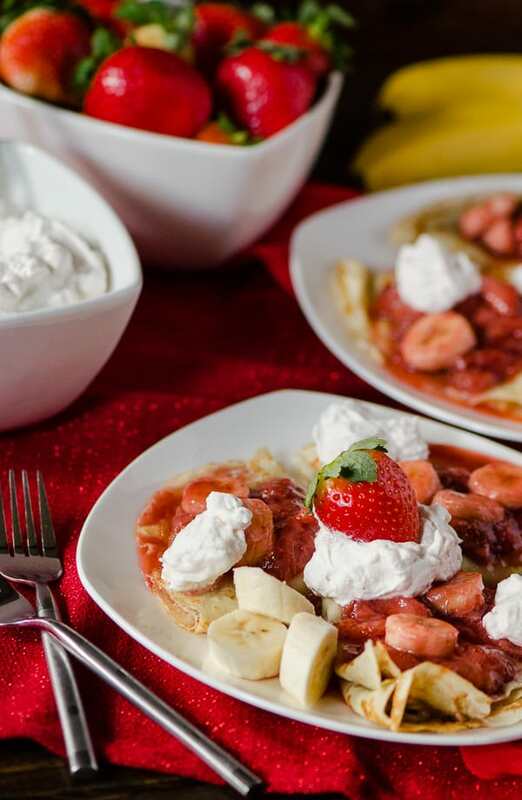 Spoon Strawberry Banana Sauce on top of each crepe, then top with Strawberry Whipped Cream and garnish with a whole berry. Enjoy! 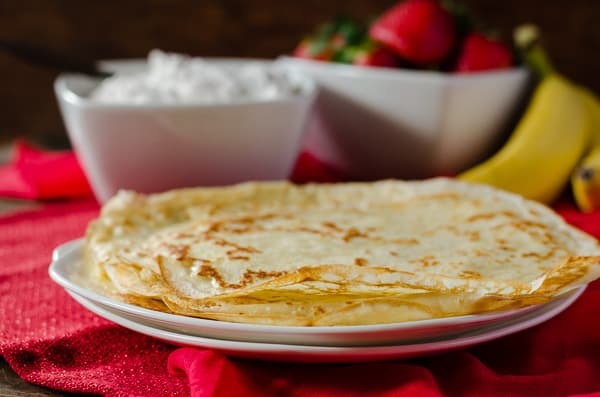 To store: after crepes have cooled, stack them and store in zipper bags; refrigerate for several days or freeze for up to two months. 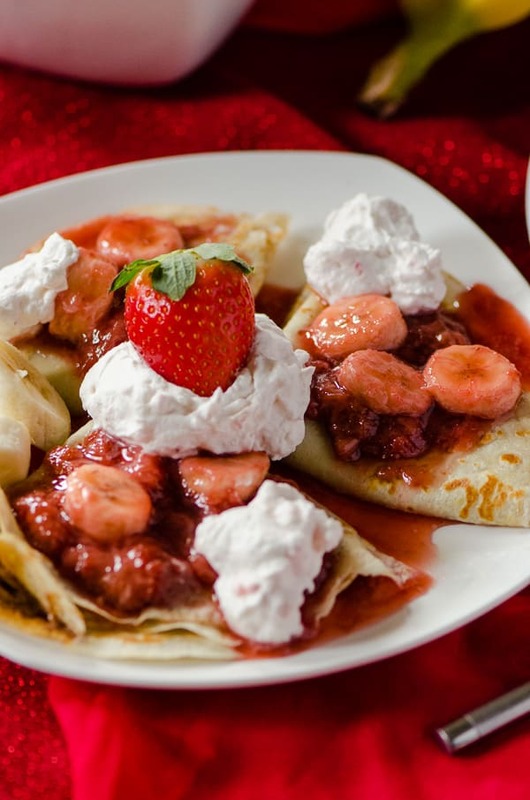 PIN THIS STRAWBERRY CREPE RECIPE FOR LATER! Celebrate your Valentine with these 20 absolutely stunning recipes! These crepes look AMAZING Erica and guess what?! I have everything I need to make these TODAY! Yummy! Definitely breakfast perfection and something my sweetie would very much enjoy. You have all of my fave things (crepes, Florida strawberries, and hazelnut!!!) all in one dish! Sorry husband, but will YOU be my Valentine? Love this recipe! I adore crepes and your strawberry version sounds exquisite! You just won my heart! 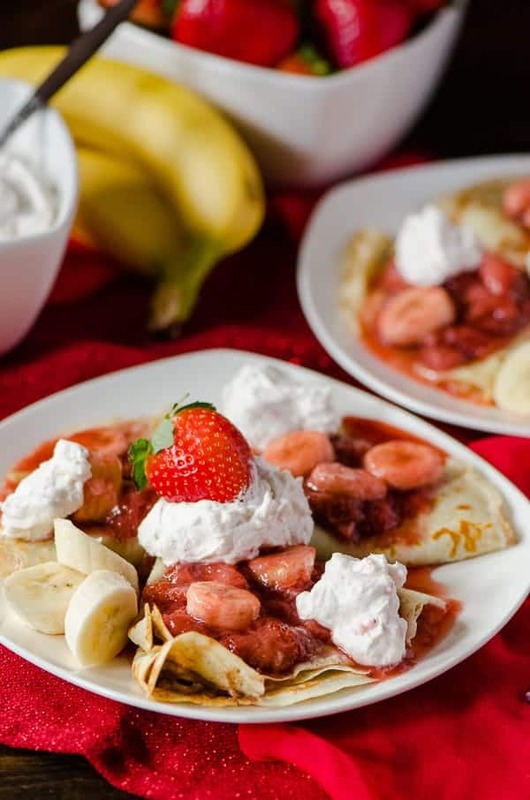 Crepes are so perfect with bananas and strawberries! Oh my goodness! 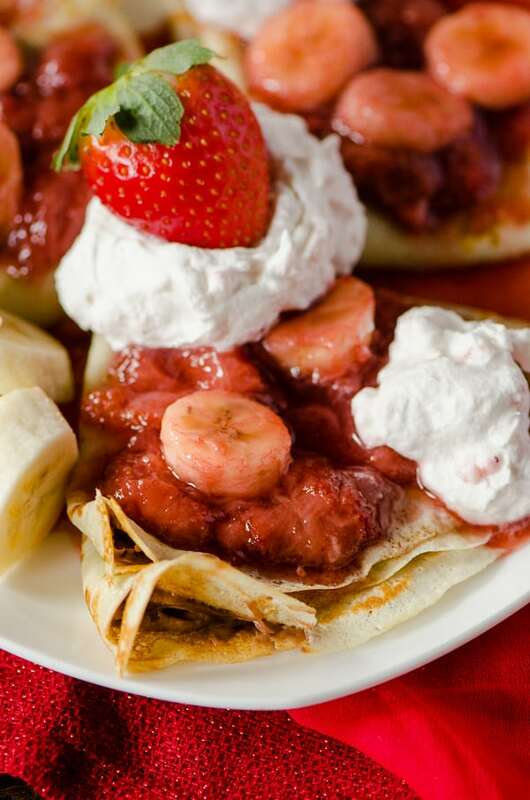 You have me drooling…strawberries, bananas, HAZELNUT cream….all folded on crepes?? Wowza! Crepes are one of my favorite things. I love all the flavors in yours! Gorgeous pictures Erica! Your crepes sound amazing! My mouth is absolutely watering for these!!!! Such great flavors! These crepes look absolutely fabulous!